Like something out of Alice’s Wonderland, my legs disappeared into a watery floor and steep banks and tall grasses climbed to my left and right - each side rising to a low, soft morning-fog ceiling into which the tip of my 9ft Winston disappeared with each cast. I was fishing in a dream tunnel, slightly too small to fully contain me - blurring the edges, crowding my perception. It was otherworldly. It was eerily comforting. It was Wisconsin. As Mary and I planned a trip to north Chicago to be present for our granddaughter’s 3rd birthday, we added a side excursion to Spring Green, Wisconsin to visit Tom and Charity, good friends who, like us, had recently retired and escaped to more rural settings. 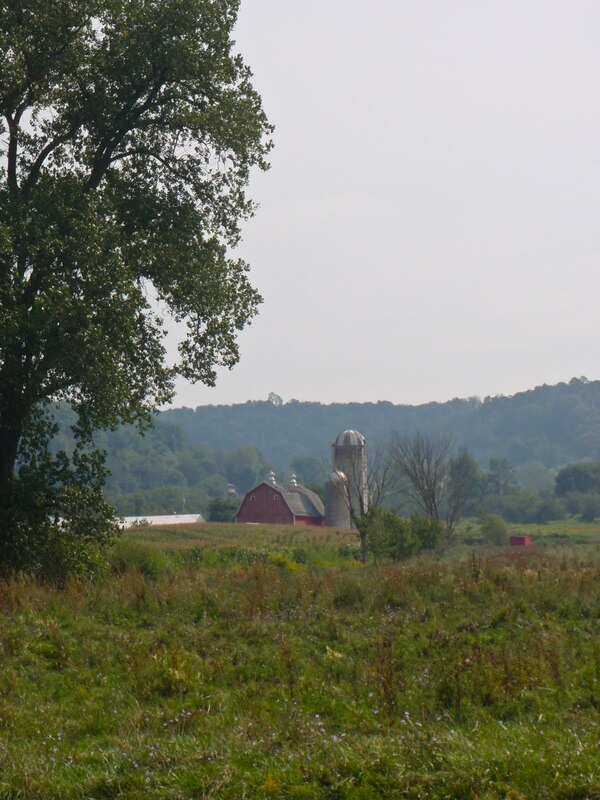 Spring Green sits on the eastern edge of the Wisconsin Driftless area, so named for its narrow escape from the drift of the glaciers that had ground most of the mid-west flat during their last advance. The scouring masses of ice were held at bay in this particular place due in part to the rough limestone formations that permeate the region – the same formations that, along with the cool springs that interlace the area, now make it the mid-west’s preeminent trout fishing territory. 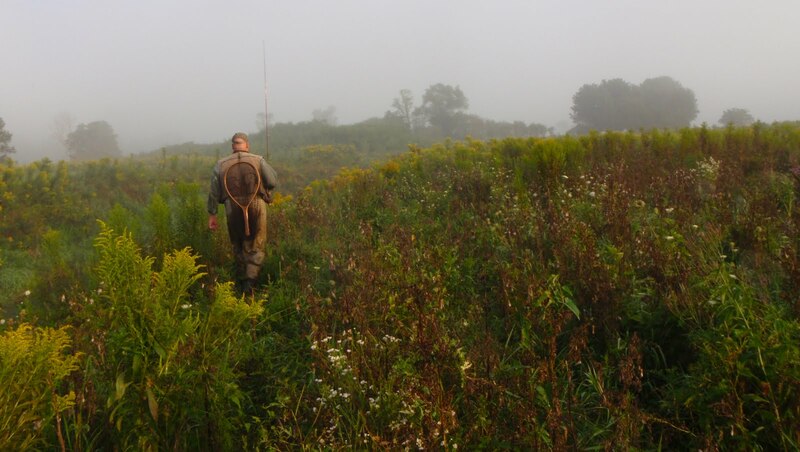 I learned of the Driftless area, and its unique geology, in my recent readings of articles and essays of the widely known Driftless trout angler, Len Harris. I also know Len as a regular contributor to the internet-based outdoor literary magazine Far and Away Online where I have also had the good fortune to have published an essay or two. On a whim, I dropped him a line and, to my delight, he agreed to join me on the stream for a day during my Spring Green visit. I met Len before sunrise in the Walmart parking lot near his home in Richland Center and followed him west into Driftless farm country. We parked our trucks at either end of a two-and-a-half mile stretch of privately owned pastureland – Len had cleared our passage with the farm owners – and stepped into foggy Mill Creek. 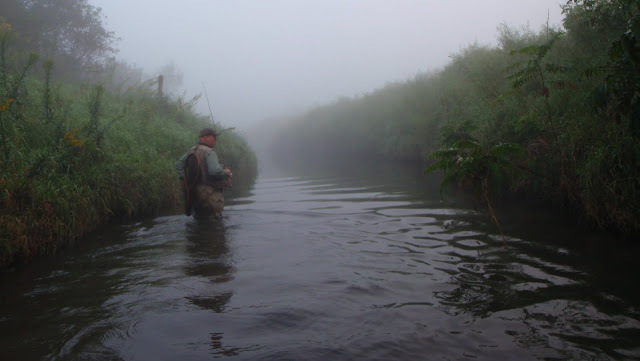 Through the dense morning fog we began moving upstream, prospecting for brown trout. Despite an extremely rainy summer, the creek was only moderately stained and not excessively high, due, no doubt, to the fact that it, like most of the hundreds of creeks in the Driftless, was limestone spring fed and quickly cleared. 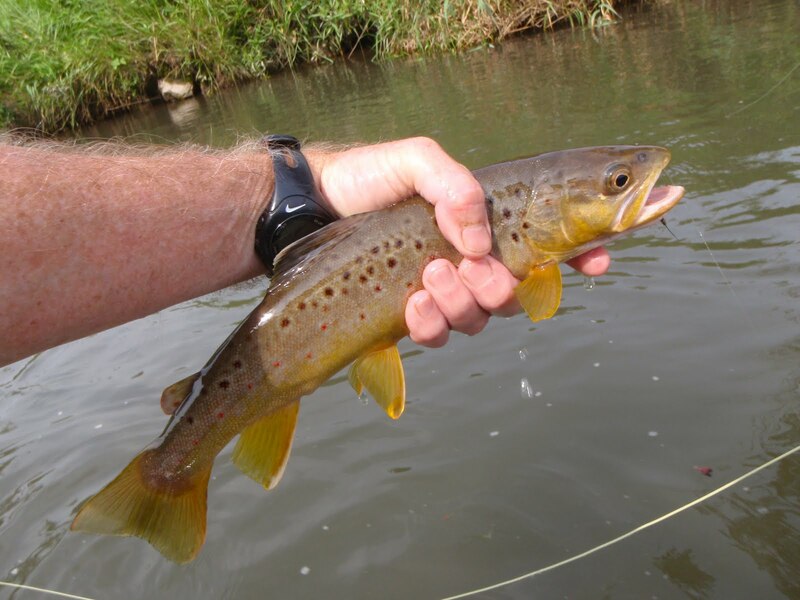 We had anticipated fishing hoppers, but the darker water and lack of visible rises prompted Len to suggest drifting a black beadhead woolly bugger or leech pattern instead. I happily obliged, fishing each with an upstream presentation, a drift with an occasional twitch for movement, and began finding browns. 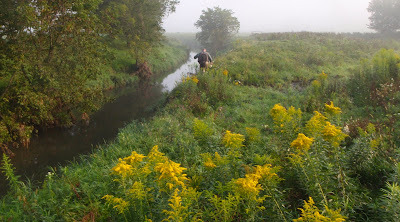 Len knew every hole, rock, riffle, and edge - and most of the big fish by name - in this pretty little waterway and expertly guided me along the creek, directing my casts as we quartered our way upstream. He had chosen to carry a light spinning rod rather than fly tackle so that we could stick more closely together in the tight quarters and regularly, after I had unsuccessfully worked a seam, would expertly pitch a small spinner into the spot and find a fish, just to prove that they lay where he pointed. My guide was constantly optimistic, saying at each new run something on the order of “When you hook the big one, keep him from the ledges on the right” or “If you get the pig that lives in that hole, let him run ‘cause there’s nothing he can break you off on here.” Sadly, I never needed to use this particular advice, or cause him to use his big trout net, but the numerous ten-to-fourteen inch fish we did catch were plenty of fun. Though the stretch was primarily brown trout territory, I also managed a nice rainbow in the final hole and later, in another small roadside run, caught a nice brook trout, completing my brown/bow/brookie trout slam. The cows, watching from above, were unimpressed. By early afternoon, the fog had burned off, the air turned steamy, and we called it a day. By North Carolina standards it was a refreshing afternoon, but Wisconsin trout, and Wisconsin anglers, were feeling the heat. Len dropped me a short hike from one last hole before saying goodbye, and described in minute detail the hundred-yard stretch I would find – every hole, every seam, every branch. And he called exactly, and correctly, where I would find my last fish of the day. Thanks, Len, for a fine, fine day. 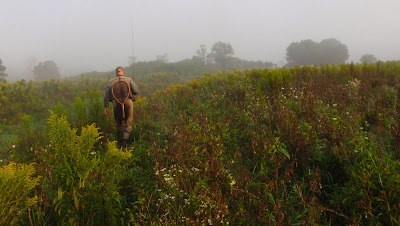 I look forward to coming back and putting that big net of yours to use on another foggy Wisconsin Wonderland morning. I’ll bring the Mountain Dew. 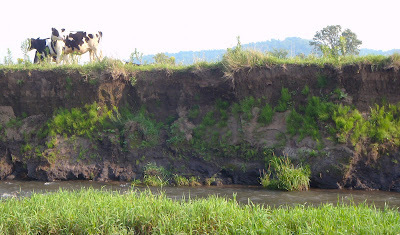 Read more from Len Harris at his blog A Stream In Time and at Far And Away Online. 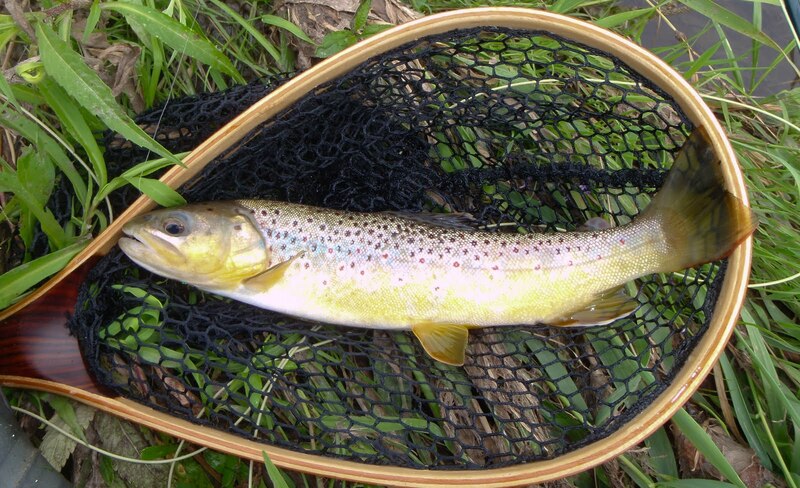 You can also see his Driftless Heart article in the current July/Aug edition of American Angler Magazine. Special and heartfelt thanks go to Tom and Chi-Chi for their marvelous hospitality during our all-to-brief stay. May you find the joy in your retirement relocation that Mary and I have found in ours. Please pass along our apologies to Bud and Sissy for the havoc created by Wilderness Dog Sammy in their feline world. And the sunsets off your back deck, overlooking the Wisconsin River, are the best. And for anyone wondering, don’t worry, I’ll be getting back to the Virginia Breakaway shortly. Excellent phots and a great read!! Come on up when the weather is cooler and some of my big water is clear and we can fish some big leeches or clousers under some log jams. Happy to have stumbled across this! 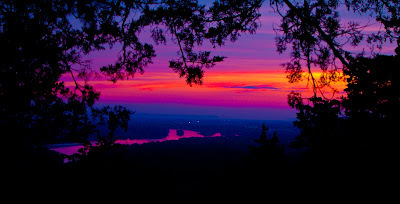 These are pictures from very close to home. 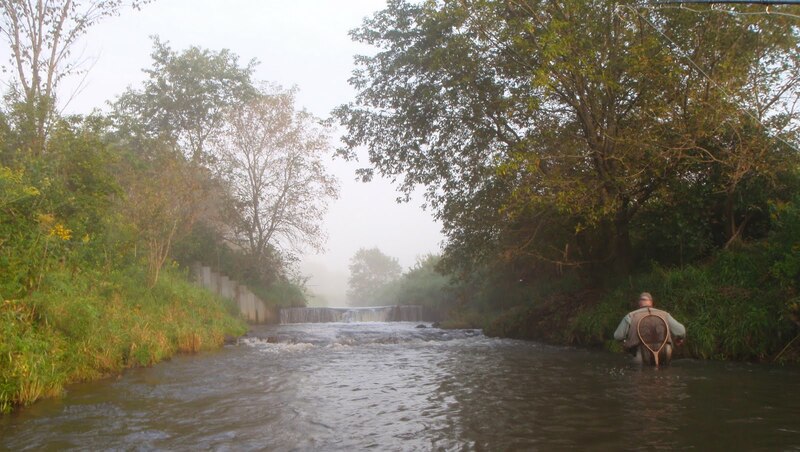 The small trout stream that runs through our land runs in to Mill Creek about a mile downstream from our house. I maintain that Mill is one of the best around. I can almost always count on around 5 to 6 from 10 to 16 inches in the stretch I wade. At any rate, it was nice to see some familiar territory when I wasn't expecting it! Can't wait to get up there with my Dad next week. Thanks for the preview, Mike!